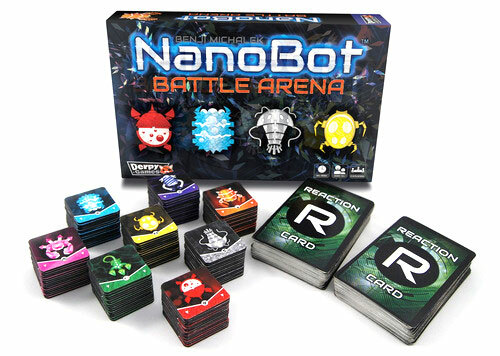 NanoBot Battle Arena is an exciting tabletop strategy game for two to eight players where each competes to form the longest chain of NanoBots. Players each take turns playing their NanoBots and cards to build their chain or disrupt others’ until someone runs out of NanoBots. Be careful to watch your bots, you don’t want to play your last one without the longest chain in your grasp! Eight strains of NanoBots can enter, one Bot leaves. There are 8 strains of NanoBots which each have their own special ability they may use to their advantage. That ability has the potential to be enhanced or diminished by an affinity to the Reaction Card played within each turn. The game's designer, Benji Michalek, goes over the game's basic and advanced rules. Add a Review for "NanoBot Battle Arena"